Continuing east on the Main Line we come to Salunga-Landisville in East Hempfield Twp, Lancaster County. The small community’s unique name derives from two sources: Salunga derives from the nearby Chiquesalunga (now Chickies or Chiques) Creek and Landisville coming from the town’s first postmaster John Landis. The small town was host to the main line of the PRR, which was the former Harrisburg & Lancaster route, as well as the Reading & Columbia a railroad chartered in 1857 to connect the city of Reading with the Chesapeake Bay region by way of the Susquehanna Tidewater Canal in Columbia, PA. Later leased by the Philadelphia & Reading Railway the line was extended into Lancaster City and Marietta, PA providing competition for the PRR in the local iron producing and agricultural regions while offering up to 10 passenger trains a day at its peak. Interlocking plate drawing for Landis Interlocking circa 1963, note the use of Reading style color light signals protecting the R&C branch. Collection of The Broad Way web archive. Landisville was a unique place on the Pennsy because the R&C and PRR routes intersected at grade, something that didn’t exist for much of the modern PRR Main Line east of Pittsburgh. Right in the heart of town the R&C, running perpendicular to the PRR and Old Harrisburg Pike (Main St.) crossed the two-track PRR main line with connecting tracks in the northeast and southwest quadrants of the intersection. 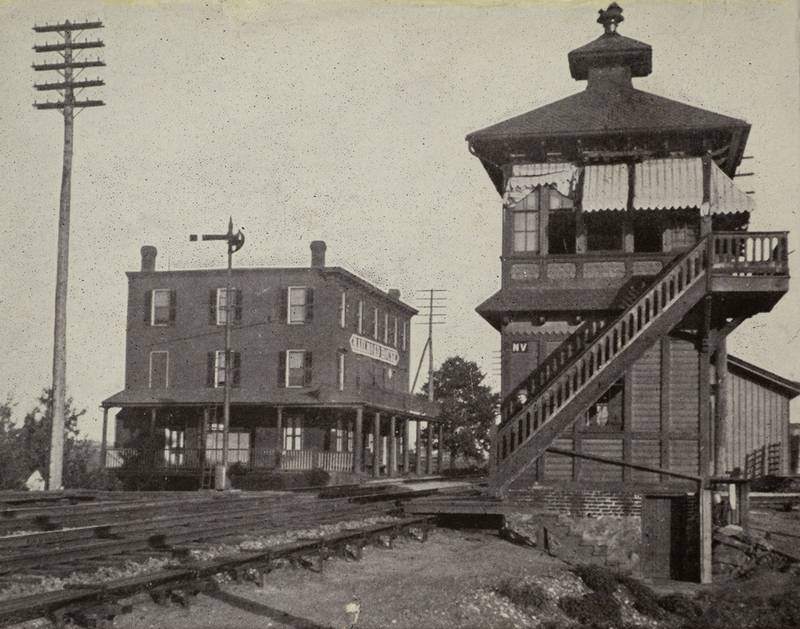 The junction was protected by the PRR using an early standard design wood frame tower similar to Shore and Lemoyne, which was located in the southwest quadrant of the intersection accompanied by a small frame station on the southeast side of the crossing. Located just across the tracks in the northeast quadrant was a railroad hotel providing convenient accommodations for passengers. NV tower named such for its telegraph call letters eventually gave way as traffic on the R&C diminished and the operator was moved to the station building next door. Landis as it was later known, as was a part time facility, occupied by a freight agent that handled the Reading – PRR interchange traffic and local customers including John Bergner & Sons Company, Keystone Boiler & Foundry and Chiques Milling among others, most of which in support of the local agricultural industry. 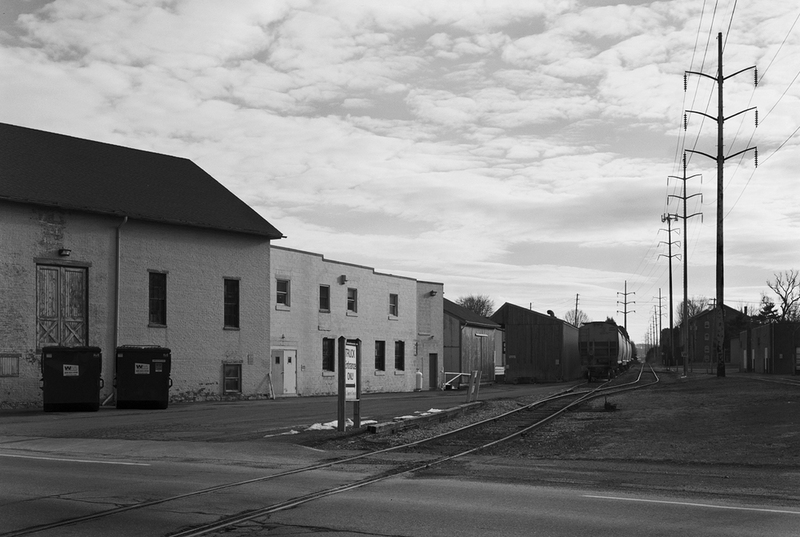 (L) The surviving station building later housed the agent/ operator for Landis Interlocking. Immediately in front of the building was the R&C and the tower was situated roughly in the area of the brush in the foreground. (R) One of several warehouses on the PRR just east of the R&C crossing, this one was once used for shipping Lancaster County Broad Leaf Tobacco. The agent here was qualified as an operator and was able to control the interlocking, which was usually set to automatic for PRR traffic, to allow a Reading train to cross the main by using a small table top Union Switch & Signal machine that consisted of five levers and three timer run-downs for signals. In a brief conversation with veteran tower operator Don Rittler, he recalls a time working the tower during track maintenance, utilizing the single crossover to divert traffic around work crews. Don lamented about the difficulty understanding the Reading Railroad dispatchers who would call to report an approaching “Buck” the nickname for the R&C local, most of the dispatchers were of German-Dutch descent and often had very thick accents. By 1985 various segments of the R&C were abandoned eliminating the need for the crossing of the PRR and thus Landis was closed. Parts of the R&C route survive including a short segment from the junction at Landisville to the southern border of East Hempfield Township to serve an industrial complex and is operated as the Landisville Railroad. This surviving segment of the Reading and Columbia branch crosses Main Street in Salunga-Landisville south of the connection with the PRR continuing to the East Hempfield Township line to serve several industries. Today this industrial track is served by Norfolk Southern crews and includes several consignees like the lumber yard immediately behind the photographer.